Learn key Photoshop techniques that allow you to work non-destructively. Why? So you can let your creative juices flow, knowing you have multiple ways of changing your mind, repurposing your work – and so you can “reverse engineer” projects you did months ago and can’t remember how you got the result. You'll learn how to work faster, to be more accurate and to open up a whole new world of flexibility and creativity. For 25 years Dave Cross has been helping photographers and creatives get the most out of their Adobe software. Dave has a Bachelor of Education, is an Adobe Certified Instructor and a Certified Technical Trainer. Dave has taught at Photoshop World (25 times), the Texas School of Photography, the Santa Fe Workshops, and has traveled across the country teaching for Kelby Training. He runs the Dave Cross Workshops in his own studio/workshop space in Tampa, FL. Dave is well-known for his engaging style, his humor and his ability to make complex topics easy to understand. In 2009 Dave was inducted into the Photoshop Hall of Fame. 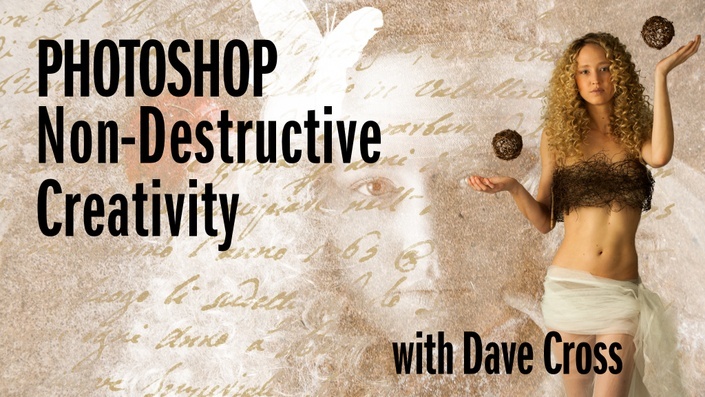 From Dave: Take advantage of my experience of teaching thousands of Photoshop users like you how to be more efficient and creative. After enrolling, you have unlimited access to this course for as long as you are a subscriber - across any and all devices you own.